To Cite: Kiilerich Lauridsen T, Krogsgaard Schaadt B, Albrecht-Beste E, Eske Bruun N. The Utilization of Fluorodeoxyglucose Positron Emission Tomography/Computed Tomography in Cardiovascular Implantable Electronic Device Infections in Case of a Negative Transesophageal Echocardiogram, Arch Clin Infect Dis. 2016 ; 11(4):e34586. doi: 10.5812/archcid.34586. Introduction: In the last decade, there has been an accelerated increase in the number of cardiovascular implantable electronic device (CIED) implantations. Similarly, CIED infections have risen significantly with a three-fold augmentation for pacemaker infections and a six-fold augmentation for implantable cardioverter defibrillator (ICD) infections. The complications of CIED infections may be critical, and related infections are associated with heightened risk of mortality. Most patients, who experience symptoms related to CIED infections present either a generator-pocket site inflammation or unspecific symptoms in relation to positive blood cultures or fever of unknown origin. The diagnosis is mainly supported by evidence of cardiac or CIED involvement by transesophageal echocardiography (TEE). Case Presentation: In this report, we describe a case of a CIED infection in a 49-year-old female, admitted in 2013 to a hospital in Copenhagen, Denmark, with persistent Staphylococcus epidermidis bacteremia without any clinical signs of generator-pocket infection and several negative TEE studies. Conclusions: The diagnosis of CIED infection was established with Fluorodeoxyglucose Positron Emission Tomography/Computed Tomography (18F-FDG PET/CT) scan revealing clear evidence of infection localized to the vascular ICD lead and generator-pocket. In the last decade, there has been an accelerated increase in the number of cardiovascular implantable electronic device (CIED) implantations. Similarly, CIED infections have risen significantly with a three-fold increase for pacemaker augmentation and a six-fold augmentation in implantable cardioverter defibrillator (ICD) infections (1). The complications of a CIED infection may be critical. The recent literature has found all-cause mortality rates for CIED infections to be up to 17% (2). Most patients, who experience symptoms related to a CIED infection, present either a generator-pocket site inflammation or unspecific symptoms in relation to positive blood cultures or fever of unknown origin (FUO) (3-5). The diagnosis is mainly supported by evidence of cardiac or CIED infection by Transesophageal Echocardiography (TEE). In this report, we describe a 49-year-old female with persistent Staphylococcus epidermidis bacteremia without any clinical signs of generator-pocket infection and several negative TEE studies. The diagnosis of CIED infection was made with a Fluorodeoxyglucose Positron Emission Tomography/Computed Tomography (18F-FDG PET/CT) scan revealing clear evidence of infection localized to the vascular ICD lead and the generator-pocket. A 49-year-old female, who underwent a left-sided ICD implantation for secondary prevention of sudden cardiac death two years ago, reported persistent fever and pain in her left shoulder. In January 2013, she was admitted to a community hospital in Copenhagen, Denmark, without a specialized cardiac unit. Physical examination revealed edema of the neck; no inflammation in the generator-pocket region or other signs of infection was noted. To investigate her symptoms, a diagnostic workup was scheduled. Growth of Coagulase Negative Staphylococci (CoNS) was found in 6/6 of blood cultures. Laboratory tests showed high C-reactive protein (CRP) levels (170-230 mg/l) and elevated white blood cell count (8.8-9.9 billions/l). Transthoracic Echocardiography (TTE) and Transesophageal Echocardiography (TEE) studies were performed repetitively without any evidence of cardiac involvement. Likewise, leucocyte scintigraphy revealed no signs of infection. Musculoskeletal ultrasound of the left shoulder showed thrombi formations in the subclavian vein as well as in the brachiocephalic vein. On clinical suspicion of a CIED infection, a six-week antibiotic treatment of vancomycin and rifampicin was initiated in accordance with national guidelines and susceptibility testing (6). Due to the negative echocardiograms and the clearance of bacteremia after only two days of antibiotic therapy, a conservative treatment approach was applied. Anti-coagulation therapy was introduced for treatment of the venous thrombi formations. Subsequently, the patient was discharged in a good condition, yet shortly afterwards was admitted to a tertiary cardiac unit in Copenhagen, Denmark, with increasing pain and swelling of the left shoulder. New blood cultures were obtained but they all remained negative. Repeated TTE and TEE studies showed no evidence of cardiac or ICD lead infection. In close temporal association to the TEE study (24 hours), 18F-FDG PET/CT scan revealed activity corresponding to the subclavian ICD lead, the generator pocket, the left clavicle and the sterno-clavicular joint indicating an ongoing CIED infection complicated by osteitis (Figure 1). The scan was performed on a dedicated FDG-PET/CT scan (Biograph 64 True D or mCT, Siemens, Erlangen, Germany). The FDG-PET/CT scans were visually classified as positive, if pathological FDG foci suggestive of infection were found. The consensus reading of Positron-Emission Tomography (PET) and Computerized-Tomography (CT) images out-ruled physiological uptake (e.g. in muscle or salivary glands) or false positive findings (e.g. urine contamination of the skin, artifacts due to high intravenous contrast concentration in the subclavian vein). Scans were visually classified as negative for infection if no pathological foci suggestive of infection were found. Thus, in accordance with International Guidelines, the pacemaker system was extracted immediately. Cultures of the intravascular ICD lead were positive for Staphylococcus epidermidis; neither repeated blood cultures nor cultures from the generator-pocket were positive for bacterial growth. The susceptibility patterns were identical to the previously found Staphylococcus epidermidis cultures. Reimplantation of a subcutaneous Cameron ICD system was performed after four weeks of additional antibiotic treatment and findings of persistent negative blood cultures. 18F-FDG PET/CT fused images (a, b, d, f) (Diagnostic CT including intravenous contrast) and 18F-FDG PET images (c, e, g); Trans-axial slices (b-c) demonstrate pathological FDG accumulation in the generator-pocket (b-c), at the vascular course of the ICD-lead in close relation with the sterno-clavicular joint (d-e), in the joint itself (f-g) and in the medial part of the left clavicle. Pathological FDG accumulation along the vascular course of the ICD-lead is shown on the coronal (d, e) and sagittal slices (f, g). No further complications were noted and the patient was discharged with three months of oral clindamycin and rifampicin treatment for osteitis. Six months after surgery, the patient had returned to an active life with no symptomatic limitations. In most cases, the diagnosis of CIED infection is straightforward. The diagnosis is defined as 1) presence of valvular or lead vegetations, 2) cardiac device recipient meeting the modified Duke criteria for IE (7) or 3) microorganisms detected by culture or histology in a vegetation or cardiac device lead. Transesophageal Echocardiography is the imaging modality of choice, but is limited to visualize intra-cardiac structures only. Further, vegetations on a lead are highly correlated to, but not diagnostic of, CIED infections; uninfected masses on leads have been found on TEE examinations in 5 to 10% of CIED recipients without infection (8). In the current case report, the patient presented positive blood cultures, but no clinical or echocardiographic signs of infection. In cases of negative TEE studies and continued uncertainty regarding whether the ICD system should be removed, the patient should be transferred to a cardiac unit with a specialized team of cardiologists and electrophysiologists. According to international guidelines (2), occult staphylococcal bacteremia is a class I indication for removal of the ICD system, thus immediate extraction of the ICD system was planned once the patient was admitted to our specialized unit. Thus, it must be emphasized that the initial treatment in these cases is removal of the ICD system, which should have been done for the case of this study at first admission. The conservative treatment approach at the community hospital was chosen due to repeated negative TEE studies and the plausibility that the bacteremia was derived from an infection in the left sterno-clavicular joint. A panel of imaging modalities is used routinely to evaluate patients with suspected of CIED. single photon emission computed tomography (SPECT) has been the imaging modality of choice for whole body screening. This imaging technique is a nuclear medicine imaging tomography technique measuring gamma rays from injected radionuclides (9, 10). Plane 2D images are obtained from multiple angels, and by subsequently applying single photon emission computed tomographic algorithm images, they are reconstructed to 3D. By fusion of SPECT images with low-dose contrast-enhanced conventional CT images, an exact anatomical localization of the enhanced isotope concentration is provided (SPECT/CT). Gallium-67 has been used as a radioactive tracer labeled to citrate (67Ga) for detection of various cardiovascular infections including IE (11). The results of leucocyte SPECT/CT in patients with IE are diverging, yet a few case reports have found SPECT/CT to be helpful for patients with cardiac device infections (12). Novel imaging modalities such as 18-fluoro-deoxy-glucose-positron emission tomography (PET/CT) has gained ground in the diagnostic workup of IE and has proven valuable especially for device and prosthetic IE. Furthermore, 18F-FDG PET/CT is a hybrid technique combining fluorodesoxyglucose marked by fluorine-18 (18F-FDG) Positron Emission Tomography (PET) and Computed Tomography (CT). The injected radioactive tracer allows visualization of areas with increased glucose metabolism as occurring in sites of inflammation and infection. Combined with a CT scan, the exact anatomical areas of increased glucose activity can be localized. In CIED, the infection may be demonstrated with PET/CT either localized to the pocket and generator area or also along the leads if deeper infection is present. Recent literature has proved PET/CT to be a helpful diagnostic tool in both FUO and early post-implant CIED infections, providing excellent correlations between the results of the PET/CT scan and the presence of infection (13, 14). An imaging modality with a good negative predictive value is beneficial for these specific cases, as the risk of both infection and mortality is significantly higher after replacement procedures than after primary implantations (15). However, the results of 18F-FDG PET/CT scan may only be decisive in cases difficult for diagnosis, such as culture negative CIED or cases with non-diagnostic echocardiograms. A potential disadvantage of PET/CT is exposure to a radiation dose of about 16 mSv, which induces an increased risk of stochastic damage. This disadvantage must be related to imaging studies carried out by conventional diagnostics, as many of these examinations could be avoided by an early PET/CT scan. Furthermore, the cost of a PET/CT scan is not negligible. However, considering that the mortality rate of CIED is as high as 17% and the rate and average cost of a CIED is 1-4% and $35.000, respectively (16), this imaging technique may still play a key role in diagnosing CIED infections. Yet the cost-effectiveness of PET/CT in patients with a CIED system requires further evaluation. 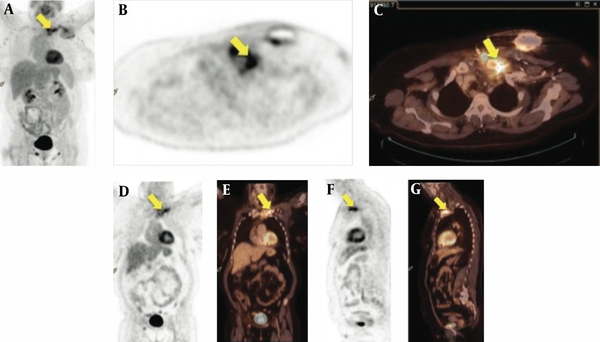 Conclusively, the use of 18F-FDG PET/CT in cases with clinical suspicion of a CIED infection with FUO or negative TEE studies may be a helpful diagnostic tool in clinical decision-making. Further studies are required in order to clarify the appropriate management of these cases. Authors’ Contribution: Study concept and design: Trine Kiilerich Lauridsen and Niels Eske Bruun; acquisition of data: Trine Kiilerich Lauridsen and Niels Eske Bruun; analysis and interpretation of data: Trine Kiilerich Lauridsen; drafting of the manuscript: Trine Kiilerich Lauridsen; critical revision of the manuscript for important intellectual content: Niels Eske Bruun and Elisabeth Albrecht-Beste; statistical analysis: None; study supervision: Niels Eske Bruun and Elisabeth Albrecht-Beste.